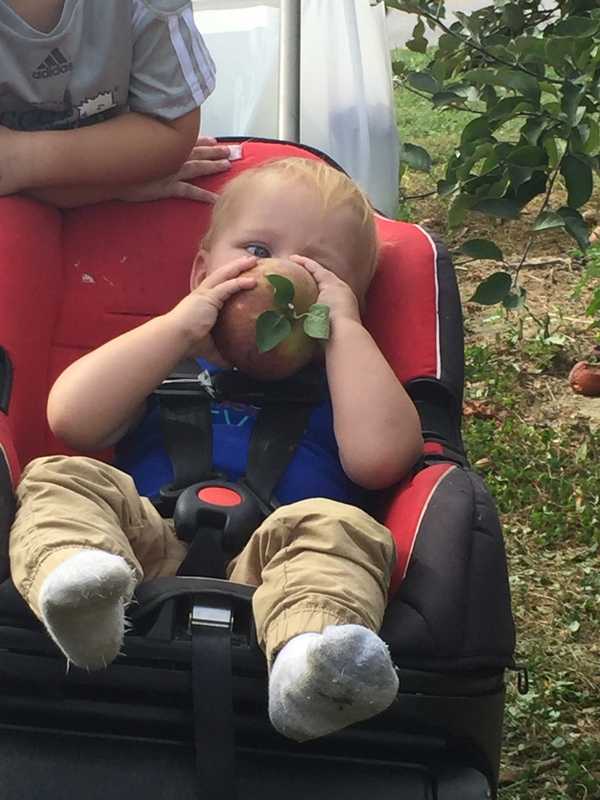 Picture: B sitting in his car seat enjoying the world’s biggest apple. He gnawed on it with only four teeth for nearly an hour. . I love fall! One of my favorite fall must-do’s is to go apple picking. It’s become a family favorite. Shortly after moving to Maryland (pre-marriage and kids), my friend Betsy and I started making it a yearly thing. Now, it’s like a family tradition and it’s so fun to share with my children. We missed last year too on account of the factthat Betsy was in grad school, so we all were especially excited to go this year. My two older children are six and four, so this was one of the first times that both of them could help with the picking. I usually do it, with a little verbal guidance from Betsy as to where to feel on the tree for an apple, but this year I welcomed the change from picker to pack mule. Upon our arrival at the farm, I realized I had forgotten my Ergo (baby carrier backpack). This was a very big deal as I would need to carry our one-year-old, new walker around. I’ve been carrying my kids this way when we’ve gone apple picking for years. I was so mad at myself for forgetting this! It’s not like we could go home and get it (we drove over an hour up to an orchard on the other side of the border into Delaware), and it wasn’t like there was a Walmart near-by for us to just zip down to either for a temporary replacement one. So, not wanting to ruin our day, I did the next best thing. I couldn’t realistically carry big bags of apples and my twenty pound son, nor could Betsy and the kids carry them all either, so we took the Sit n’ Stroll with us. Just a note, the Sit n’ Stroll is our car seat/stroller combo. The wheels retract into the base while being used as a car seat. It’s worth its weight in gold and one of my favorite baby products as a blind parent. (See my post on this gem) but it’s not really the most road worthy as it’s mostly designed for airport or mall travel. Definitely not farm land. After a quick perusal of the craft displays and a visit to the port-a-potty, we headed down the road to catch our tractor wagon down to the orchard. You can imagine the sight of me helping the other two kids onto the wagon, passing one of them my cane to hold, and then climbing up myself while hoisting B strapped into his car seat in front of me. But, we made it and soon we were all excitedly picking some of the biggest apples I’ve ever seen and enjoying a little snack along the way. After a while, we had three large backs (about 50 lbs.) between Betsy and me, and the kids had enjoyed themselves. Thankfully, the car seat had hung in there only getting stuck occasionally. We decided to load the car seat with the bags of apples and that I would carry B back to the wagon. WE thought this would work easier. And then it happened! One of the wheels got stuck in a rut and we were a bit too forceful in trying to free it when it suddenly snapped at the shaft of the wheel. I could have cried! Not only are these car seat stroller combos expensive and hard to repair, but I rely so much on it since I have to transport car seats so often from car to car and place to place. The other frustrating thing is that the same thing happened to our first Sit n’ Stroll which we practically wore out because we used it so often for our first two children. In that case, however, the wheel must have had a crack or something and already been compromised because it snapped off in the same way one night when I was pulling it up our driveway. I was never able to contact customer service to find out how to repair it as all the website contact info was outdated. I ended up finding a used one on Amazon and just purchasing a second one. The thought of having to go through the same process again, or purchasing another one was so disheartening. Somehow we made it back to the wagon, though it was rough going. I carried B, one large bag of apples and sheparded the other two kids while Betsy manhandled the stroller with the other two bags of apples trying her best to keep it level so we could at least push it with the three wheels on the uneven ground. I’m sure her arms ached the next day. We finally made it back to the wagon and loaded everyone on. When we got back to the drop off in the parking lot, the kids, apples, and I stayed there waiting while Betsy went and got her car and drove it back to pick us up. Did I mention she’s a really, really great friend? Everyone needs a Betsy in their lives. By this point, the kids were cranky and so was I. It was time for a late lunch and to head home. Upon leaving, we stopped off for lunch at Wendy’s where I tried drowning my sorrows in a chocolate frosty before calling Jesse to share the bad news with him. 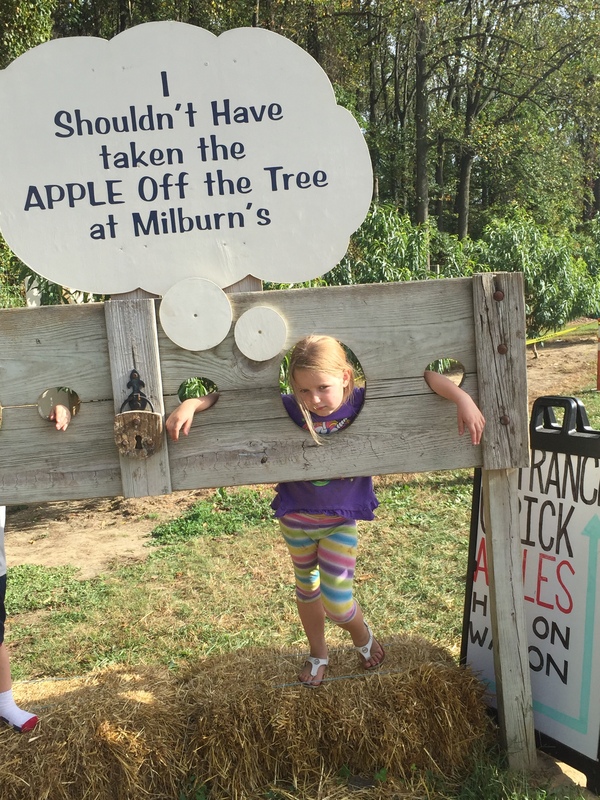 All in all, not my favorite apple picking adventure, but definitely one that will be remembered. Isn’t it funny how the things that go wrong later are the memories we look back on with a smile and fondness? I can’t wait until this feels that way because right now I’m still a little sad over the whole thing. It’s been a few weeks now and I’ve not yet replaced the stroller, but I’m going to have to as there is no way to send it in for repairs—at least to my knowledge. So, that will be dipping into the “Mary Jo shopping spree fund” (as if I really had one.  It’s also made some of our outings a bit more difficult, but I’m getting arms of steel from carrying the car seat when I’d normally pull it, and saving us a little money on rides on nice weather days since I’m more inclined to walk or take public transit so as to avoid having to juggle multiple car seats. So, I guess there are some small perks to be enjoyed. I’ll end on a positive note though and say that we’re still enjoying some delicious apple treats. Hopefully we’ll have better luck next year.